We sampled three versions: at The Melt, Sacred Wheel Cheese Shop, and Bar Dogwood. 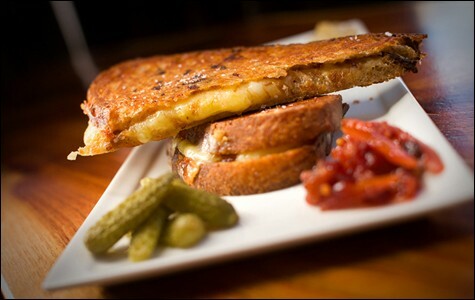 The grilled cheese sandwich at Bar Dogwood has the perfect bread-to-cheese ratio. Hours: Sun.-Mon. noon-5 p.m., Tue.-Sat. 11 a.m.-8 p.m. Hours: Mon. 4 p.m.-1 a.m., Tue.-Sat. 4 p.m.-2 a.m., Sun. 6 p.m.-1 a.m. If there were a Hall of Fame for classic American comfort foods, the grilled cheese sandwich would surely be a first-ballot inductee. Yet whenever I see the melty, buttery object of childhood nostalgia on a restaurant menu, I feel skeptical. After all, any home cook can make a decent grilled cheese in a matter of minutes, often for less than a dollar. So whenever a restaurant touts its "artisanal" take on the sandwich, priced at $5 or more, it invites the obvious question: How much value is really added? Recently, I visited three grilled-cheese purveyors — The Melt, Sacred Wheel Cheese Shop, and Bar Dogwood — to see if local chefs, whether through art or science, had been able to elevate this simple classic. The San Francisco-based chain The Melt made a splash when it launched in 2011, in part because of the company's high-tech slant — its app-based ordering system and its proprietary, induction-heat-based Electrolux sandwich-grilling machines. The location near the UC Berkeley campus is bright and white — a cross between an Apple Store and an Au Bon Pain. Signs proclaim, in cheerful typography, the chain's commitment to peak-season produce, and the sandwiches are cooked to order. Still, at its core The Melt is a fast-food joint — and a somewhat expensive one, with a basic grilled cheese sandwich starting at $4.75. More importantly, though, the food was just okay. The sandwiches were toasted golden-brown and had an appropriate level of crunch, but the aged cheddar that the restaurant uses was fairly nondescript, and it was hard to tell the difference between a sandwich that came on sourdough and another that came on plain old "artisan white." The mac 'n' cheese stuffed inside one of the specialty sandwiches (the "Mac Daddy") added extra carbs, but little else. The best of the bunch was the Ballpark Melt, a seasonal special that had sliced hot dogs and tangy, 'kraut-like grilled onions — that extra bit of flavor and texture made all the difference. Yet all of the sandwiches suffered because of too-dry bread. Fortunately, The Melt's puréed soups are the best part of the menu. They're ideal as dipping sauces for the sandwiches — a smoky sausage and pepper number was especially great. But adding a soup ups the cost of your meal to $9 or $10. For that price, you'd be better off with the superior soup-and-sandwich experience at Temescal's Sacred Wheel Cheese Shop. Owner Jena Davidson and her crew serve a full American comfort-food menu all day long, and the food is legitimately great — from the colorful pickled eggs to what may be the best mac 'n' cheese in town (the "Bernie Mac," which is cut into squares and seared on a panini press, for a thin, impeccably crisp brown top). But the shop's bread and butter (ha ha) is its grilled cheese sandwich — the perfect product for a cheese shop, where you have a near-limitless variety of high-quality cheeses. 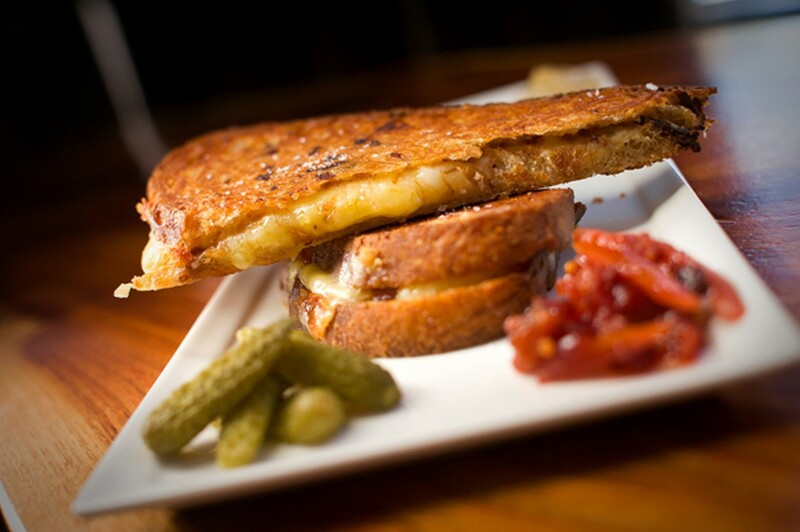 Sacred Wheel's standard "Grilled Cheese Trinity" comes with a blend of three cheeses, which change every day. Bread options include sourdough, rye, and — my favorite — Texas toast, a soft white bread that has extra butter baked into it. Because, quite frankly, what grilled cheese sandwich can't be improved by adding a little more butter? All in all, these were excellent sandwiches — the bread toasted just right, with the perfect amount of butter; the three-cheese blend (cheddar, Gruyère, and a Spanish Manchego on this occasion) tasty, if not entirely distinctive. Davidson said she tries to please customers who want that "classic," mild grilled cheese taste; occasional specials use bolder cheeses. And Davidson's legendary PBR tomato soup — each batch made with an entire twelve-pack of Pabst Blue Ribbon beer — is the perfect tangy, slightly spicy accompaniment. But in the end, my favorite grilled cheese sandwich wasn't served at a restaurant, but at an Uptown Oakland bar. Sitting at Dogwood, amid the stuffed pheasants and air rifles mounted on the wall, you can enjoy a tasty adult beverage with your grilled cheese sandwich. Chef-owner Alexeis Filipello serves just one version — with a variety of house-made add-ons — but each component is carefully selected: French butter, sliced levain bread from Semifreddi's, a sprinkling of Maldon sea salt on top, and a blend of two cheeses: an English-style cheddar that gives the sandwich its memorable sharpness and savoriness, and a local mozzarella, which adds the stretchy, stringy element that Filipello said was what she remembered most fondly from eating grilled cheese as a kid. The bread, perfectly toasted on a panini grill, works especially well because it's sliced so thin, resulting in a bread-to-cheese ratio that's just right. There's no tomato soup, but there is a coarse house-mixed Dijon mustard for dipping, and little cornichons on the side. Add-ons range from an amazing, smoky whiskey-bacon chutney to a tomato jam that will appeal to diners who like to mix their sweet with their savory. Here, finally, the grilled cheese sandwich (also available at Filipello's other restaurant, Stag's Lunchette) is elevated to high art — art that would be hard to duplicate at home because the cheddar Filipello uses is exceedingly difficult to get a hold of, and because of the premium add-ons. And, priced at just $5, plus an extra dollar or two for each add-on, it's a relative bargain. If you're the kind of persnickety diner who, like me, has scoffed at the idea of eating grilled cheese outside of the confines of your own kitchen, I suggest you give this one a try.